Seriousness and monumentality: the worthy worship by a nation of its national hero. 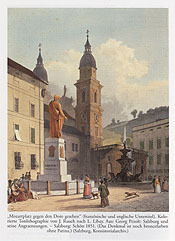 Rudolf Angermüller, Das Salzburger Mozart-Denkmal: Eine Dokumentation (bis 1845) zur 150-Jahre-Enthüllungsfeier. 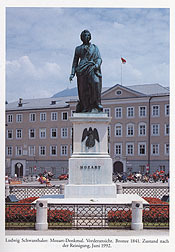 (Salzburg:Internationale Stiftung Mozarteum, 1992), p. XII [top]-XIII [bottom].